Looking to watch YouTube TV abroad? In this post, we’ll explain what YouTube TV has to offer, how to sign up from outside the US, and how you can use a Virtual Private Network (VPN) to live stream YouTube TV from anywhere in the world. We’ll also be covering some of the best VPNs for YouTube TV. Like most popular streaming services, YouTube TV geo-blocks its content. This simply means that you can only watch from a specific country, in this case, the US. 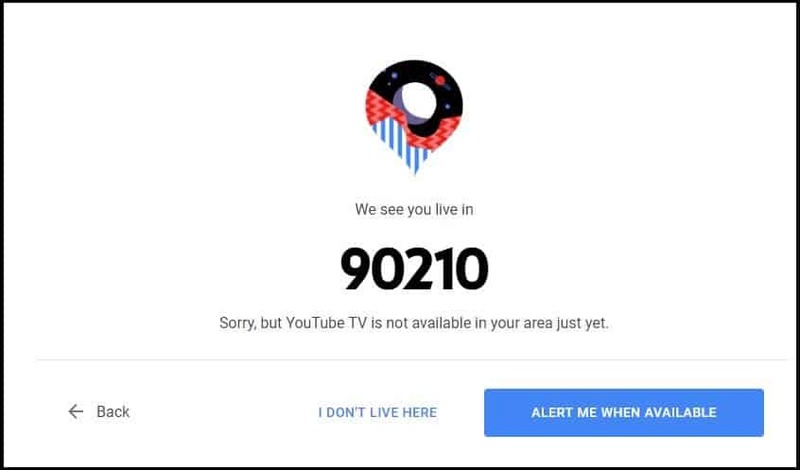 As a result, if you try to access streams from outside of the US, you’ll see a message saying “Sorry, but YouTube TV is not available in your area just yet.” However, you can watch YouTube TV from other locations using a VPN. When you connect to a VPN, you’re given a temporary, region-specific IP address. This enables you to spoof your location and trick websites into believing you’re located somewhere else. VPNs have other advantages too: they reduce the risk of triggering automated fraud prevention measures when accessing your online banking service from a different country. Further, because VPNs encrypt your traffic, they stop third parties like hackers or your Internet Service Provider (ISP) from monitoring your activities. Start by signing up to a suitable VPN service (we recommend ExpressVPN). Next, install the VPN software. Most services offer apps for Windows, MacOS, iOS, and Android, so make sure to get the right version. Try loading video on YouTube TV. It should start playing almost immediately, but if not, try refreshing the page or clearing your browser’s cache and cookies. If you’d like to watch a specific show live, we recommend performing the steps above before it actually airs. This gives you time to contact customer support if anything doesn’t work as intended and means you may not have to miss part of your favorite show. HOW TO GET A PREMIUM VPN FREE: If you only need a VPN for a short time, for instance, if you’re going on vacation or want to watch one geo-restricted event, you can use ExpressVPN’s, 30 day money-back guarantee. You will have to pay upfront but can cancel at any point to receive a full refund, effectively making it a 30 day free trial. Capable of unblocking YouTube TV and similar services from abroad. Has a wide network, with several US servers to choose from. Uses powerful encryption and offers additional security options. Does not log any personally identifiable information. Has both mobile and desktop apps, with minimal differences between each version. ExpressVPN has servers in 20 different US cities (and more than 2,000 globally), which means that you can not only use it to access YouTube TV, but you’ll also be able to watch various city- or state-specific broadcasts. This VPN is ideal for streaming: it’s fast enough to watch live HD content without any noticeable buffering, and even enables you to unblock platforms like Netflix, Hulu, and Sling TV from abroad. 256-bit encryption is enabled by default, and ExpressVPN keeps your activities private using DNS and IPv6 leak protection, a kill switch (desktop apps only), and perfect forward secrecy. No personally identifiable information is logged, so if you pay with Bitcoin and use a throwaway email address when signing up, you’ll be effectively untraceable. If you have any problems, customer support is available via 24/7 live chat. This service offers apps for Linux, MacOS, Windows, iOS, and Android. Manual installation is required for supported network routers but this can be done quickly and easily with ExpressVPN’s custom firmware. BEST VPN FOR YOUTUBE TV: Choose ExpressVPN’s one-year subscription to get an extra three months free and save 49%. ExpressVPN is our top rated VPN thanks to great speeds, great security features and its ability to unblock content and streaming services. NordVPN boasts a network of more than 5,000 servers worldwide, with clusters in 20 different US cities. With specialized servers catering to users who want to share files, access Tor, or game without fear of DDoS attacks, it’s a strong general-purpose VPN. However, it’s also excellent for streaming thanks to its high speeds and excellent unblocking capabilities. NordVPN can unblock platforms like Netflix, BBC iPlayer, and of course, YouTube TV, from anywhere in the world. This service uses 256-bit encryption and includes a wide range of additional security options. There’s an application-specific kill switch, a dual-VPN feature, an automatic ad-blocker, a malware-scanner, and protection against WebRTC, IPv6, and DNS leaks. This VPN has a strict no-logs policy, so you can rest assured that your activities will remain private at all times. NordVPN has apps for Windows, Android, MacOS, iOS, and Linux devices. It has to be manually configured on wireless routers, however. LONG-TERM DISCOUNT: Save 75% by signing up for NordVPN’s three-year deal here. This brings the cost to just $2.99 per month. CyberGhost works slightly differently from most VPNs in that you can choose a server yourself or specify a task (such as unblocking streaming sites or browsing anonymously) and have a suitable server assigned to you. It offers almost 3,000 high-speed servers worldwide, with 496 of them in the US. With the ability to connect up to seven devices at once, CyberGhost makes it easy to access whatever you want, wherever you want. This service uses 256-bit encryption as well as DNS, IPv6, port forwarding, and WebRTC leak protection to keep your traffic secure. It includes a kill switch in every version of the software, an ad-blocker, and an anti-malware scanner. CyberGhost does not log any personally identifiable information, and accepts Bitcoin for maximum anonymity. This VPN comes with user-friendly Android, Windows, MacOS, and iOS apps. Manual installation is required for Linux-based systems and selected internet routers. TRY IT RISK-FREE: Get six months free and save over 70% with CyberGhost’s annual plan. This includes a 30-day money-back guarantee, so there’s no risk whatsoever. IPVanish has long been a favorite for streaming thanks to its expansive server network and strong multi-platform support. It currently has more than 1,100 servers across 60+ countries, including 520 in the US. IPVanish is fast enough to watch high-definition live streams with no interruptions and can reliably unblock YouTube services. Further, this service permits up to ten simultaneous connections, making it a strong choice for those looking to protect all of their devices at once. On the security front, there’s 256-bit encryption, a kill switch (in both the mobile and desktop versions), and DNS and IPv6 leak protection. IPVanish also includes several features most other VPNs don’t. You can block local traffic, for instance, or obfuscate OpenVPN traffic. As IPVanish doesn’t log any information that could identify you and allows users to switch IP addresses regularly, it makes users very difficult to track online. Support is available over live chat, 24/7, in case of any issues. IPVanish has lightweight apps for Windows, MacOS, Amazon Fire, Android, and iOS. Linux devices and select wireless routers are supported but must be configured manually. READER DEAL: Our readers can save 46% on IPVanish subscriptions. Each of these includes a risk-free, 7-day money-back guarantee. PrivateVPN is ideal for live streaming thanks to its excellent unblocking capabilities and high speeds. It has around 80 servers globally, and 10 of these are in the US (in 10 different states). This service has no problems streaming HD content on platforms like YouTube TV, Netflix, and Hulu, even from abroad. With six simultaneous connections allowed, PrivateVPN lets you protect all of your most commonly used devices with a single account. This VPN has a strict no-logs policy and accepts Bitcoin, meaning you can register anonymously as long as you use a disposable email address. It uses 256-bit encryption by default, includes a kill switch that stops traffic when your connection is lost, and protects against WebRTC, DNS, and IPv6 leaks. Customer support is available 24/7 via live chat, and with your permission, the staff can even remotely install the software for you. This service includes dedicated Android, iOS, Windows, and MacOS apps. PrivateVPN also works on Linux-based systems and routers but requires manual configuration first. FIVE MONTHS EXTRA: PrivateVPN’s annual plan comes with five months free and includes a discount of more than 70%. Free VPNs often claim to provide the same level of service as their premium rivals, but this is far from the reality. These VPNs usually have much larger user bases yet fewer servers to spread the load. As a result, you can expect extremely slow browsing speeds and videos that stutter, have low resolution, and frequently pause to buffer. Further, as YouTube is one of the largest streaming services in the world, it’s unlikely that a free VPN will be able to bypass its geo-restriction measures in the first place. Maintaining an international server network is expensive, so how can free VPNs afford to operate? The truth is that they’ve found various ways to profit from their users, whether it’s by placing ads onto the sites you visit, or using tracking cookies to amass a detailed dossier of your online activities. VPNs are designed to increase your online privacy, but by selling your data to unknown third parties without your knowledge, free services can actually reduce it instead. It’s always difficult to choose which VPN to use, but it’s even harder with a free service. According to a 2015 study, the Google Play Store hosts dozens of supposed VPN apps that actually install malware on your device. Even if you find a seemingly legitimate service, there’s a good chance it doesn’t encrypt your traffic or protect against IPv6 leaks. Well-known services don’t guarantee your safety either, as we found when Hola was caught selling user bandwidth to help run a botnet. Can I sign up for YouTube TV from abroad? 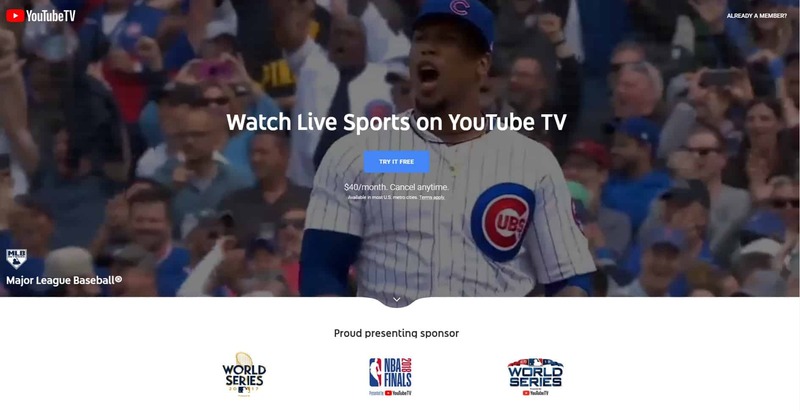 Although YouTube TV is technically only available in the US, it’s actually possible to sign up from anywhere as long as you have a PayPal account. When using a credit or debit card to pay, YouTube TV requires it to be registered to a US address, but unlike many similar services, YouTube TV doesn’t check to see if you have an American PayPal account. Don’t want payments to be taken via PayPal? There’s a third payment option, one that’s not presented to the user during registration: Google Play gift cards. Just log in to the same Google Play account you signed up to YouTube TV with, redeem a gift card, and if you have enough credit, you’ll find that this service deducts the subscription fee from your balance instead of charging your card or PayPal account. I fear this is not correct… YouTube TV does recognize now the use of VPN networks and blocks the viewing. I have used it for a month in Switzerland, but now they changed something! I tried with HMA and NordVPN – both were recognized by YouTube TV. Hi Ian, I installed NordVPN on my IPhone but I noticed that the YouTube TV app does not recognize the VPN location and still works on my home location. Do you know how can I change that? I am using Astrill. I used to be able to connect but now I cannot. My husband, using the same router, can. Youtube TV senses my proxy/vpn. I cannot get around it. Any ideas? I have worked with the Astrill agents to no avail.